Jakarta has a reputation as an impenetrable place. Viewed from atop one of the many business hotels in the center of the city, the Indonesian capital is a sea of gray stretching into the haze. No one knows for sure how big metropolitan Jakarta actually is—maybe 10 million people or more in a region almost the size of Kuwait. What’s clear, though, is that while this city is rich relative to the rest of the country , its city managers were miserly when it came to building the ribbons of roads and rail needed to bind its residents together. The few grand boulevards and toll roads that slice through Jakarta are jammed so tightly that walking from car rooftop to rooftop seems feasible during rush hour—roughly three hours from six o’clock in the morning and then again for about four hours in the evening. Japanese-made minivans inch through key interchanges so slowly their drivers can buy bags of dried bananas, peanuts, and magazines from hawkers; rattletrap buses belch black filth; and all notions of right-of-way are wishful thinking. Average round-trip commutes of about 50 miles take four hours, prompting some to keep blankets and pillows in their cars for when things really get bad. Unsurprisingly, then, Jakarta underwhelms in comparison to other world centers. Last year, in its annual liveability index, the Economist Intelligence Unit ranked Jakarta 116—below Almaty, Kazakhstan, and New Delhi—out of 140 cities. Residents call Jakarta, with its pleasant weather and people to match, “The Big Durian” after the sweet Southeast Asian fruit that emits such an overwhelming stench of blue cheese and sweaty gym clothes that it is banned by most airlines and hotels. The key to making life in Jakarta a little easier is speeding access to both places and services. 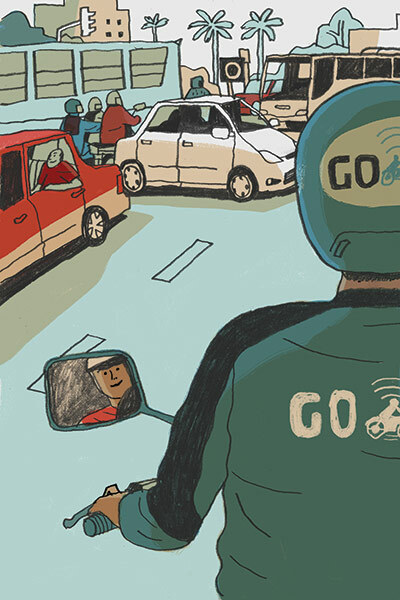 With more than $1 billion of investor funding between them, three former HBS classmates—Nadiem Makarim of Go-Jek and Anthony Tan and Hooi Ling Tan of Grab (all MBA 2011)—are doing this through competing on- demand ride services, seizing on the fast-growing use of smartphones in Southeast Asia’s biggest economy to reach wealthy and technologically savvy consumers fed up with gridlock and delay. At the heart of each business: a vision to change how Jakartans navigate the city’s congestion and transform their relationship with this sprawling metropolis. Nadiem Makarim arrived in Jakarta in 2006 as a consultant with McKinsey. Although the company provided a car and driver, Makarim, who had lived in Indonesia as a child, preferred to use the ubiquitous motorcycle taxis. Known as “ojek,” the two-wheelers were informally organized. Most neighborhoods had a collective of drivers whiling away the hours under a sheet of blue tarp for shade, waiting for fares. Often, their only advertisement was a small hand-drawn sign tied to a post with a bit of wire. It was while attending HBS that Makarim formed Go-Jek, a more efficient ojek service that organized 20 or so drivers through a call center; he relied on word of mouth to market the idea to friends and relatives in a city that was riding high on the boom of commodity export prices. Incomes were soaring, and by some measures about 1,000 new cars were being added to Jakarta streets every day. Not long after his graduation in 2011, Makarim joined Germany-based e-commerce investment firm Rocket Internet as its Indonesia head. There he learned how to scale up companies fast and satisfy finicky customers. It was a baptism by fire that gave Makarim the confidence to turn to Go-Jek full-time and reimagine the company as an app-based service similar to Uber. Uber, which launched in San Francisco in 2010 but had not yet expanded into Asia, had whetted investor appetites for the on-demand business model. Its success was linked to the proliferation of smartphones in the United States, which made quickly ordering a car to the user’s location possible. A similar trend was emerging in Jakarta. That rapid growth of internet- ready cell phone ownership helped Makarim sell his idea to investors, and by 2014 he had secured the capital necessary to expand Go-Jek rapidly. Almost overnight, Go-Jek overhauled the image of the lowly ojek. Before then price gouging of the uninitiated was rampant, and ojek were considered so unsafe that some foreign companies wouldn’t let their expatriate employees ride them. By comparison, through the Go-Jek app a user could now summon a ride in seconds just as a New Yorker could summon an Uber. Routes were traceable, fares were calculated transparently, and passengers could pay with cash—a big selling point in a country where less than 10 percent of the population has credit cards. Go-Jek drivers offered their customers rain gear and surgical masks as protection against the streets’ noxious fumes. And all Go-Jek drivers received road safety training; gone were the white-knuckled rides through red lights. Insurance provided additional peace of mind. Go-Jek drivers themselves sported a more professional look, decked out in jackets and helmets the color of a green apple with the company logo splashed across both in white. Some drivers say their salaries doubled, thanks to improved efficiency and demand. Once almost untouchable, Go-Jek drivers quickly became tightly woven into the fabric of everyday life in the city. 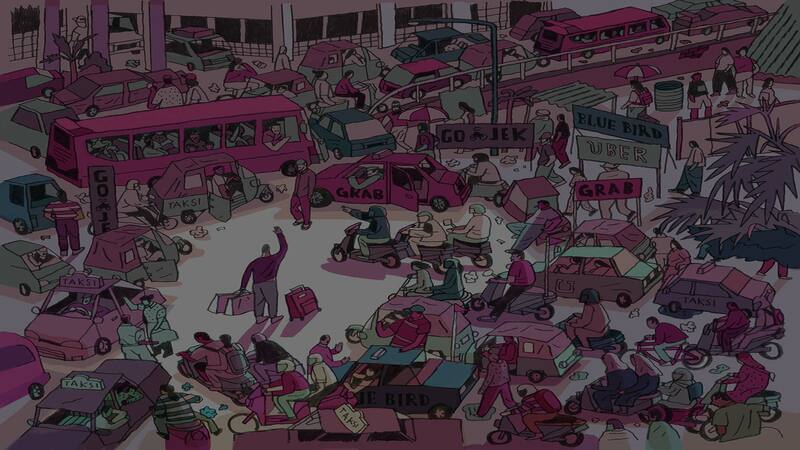 But Go-Jek was not the only company to recognize the business opportunity Jakarta’s congestion presented. The city had also long been poorly served by four-wheeled transportation. In 2012, there were only about 1.4 taxis for every 1,000 people in Jakarta compared with 10.2 in Bangkok, and most of those were concentrated in the downtown area where the office jobs and wealthier residents congregate, despite the fact that taxis were often seen as a lower- class transportation option. To address this, CEO Anthony Tan and COO Hooi Ling Tan (no relation to one another) expanded their Grab car-hailing app to Jakarta in June 2014. Later that year, Uber launched its car service in the city. Grab had started as MyTeksi in Malaysia in 2012, designed to match available cabs with demand and to make taking a cab less like a game of Russian roulette; high prices and grumpy drivers were all too common. “People didn’t trust the Malaysian taxi system,” says Anthony Tan, echoing criticisms of Jakartan taxis and ojek. Tan recalls the early days of the business, hiking out to Kuala Lumpur’s airport to demonstrate the benefits of his smartphone app, alternating between emphasizing its potential to offer riders better service and drivers a steady business. “On the demand side, many passengers couldn’t get taxis when needed and were constantly concerned about their personal safety or being ripped off,” he says. Grab now operates in six Southeast Asian countries and has raised more than $700 million to date, with another funding round underway. In Indonesia, Grab took an early lead on Uber in part because the service let passengers pay with cash. Then, in mid-2015, Grab began offering ojek rides with a business model that in many respects mirrors Go-Jek’s, down to the green helmets and jackets that its drivers wear. In a city short on a transportation infrastructure, the companies are also competing as delivery services. Both have teamed up with big e-commerce sites offering merchandise delivery to customers amid an explosion of online retail options. Grab users can also courier parcels or order food delivery through its app. Go-Jek’s app does those things too, and also lets users order concert tickets and even a beautician to their office or home. Elsewhere in Asia, this new ride-hailing sector is as competitive, as global Uber and region-wide Grab compete with local startups. In China, Uber was up against Alibaba-backed Didi Chuxing until that company purchased Uber China in late July. In India the home turf favorite is Ola, and in Hong Kong and Singapore, Grab and Uber face small upstarts like Ryde, founded by Terence Zou (MBA 2009). Zou was inspired to launch the app-based ride- sharing service while Christmas shopping in Singapore’s Orchard Road in 2013. “I could not get a cab, and I saw all these cars going by with just a driver,” he recalls. Ryde describes itself as a carpooling service, monetizing empty seats, allowing a driver to split the cost of gas or tolls for a given trip to the airport or into work. Passengers can pay as little as half what would ring up on a taximeter for the same distance. Although still a niche player, Zou is betting there is opportunity in what he estimates to be 3.5 million private trips Singapore residents make every day without adding to congestion. “This is the greener, leaner way to go,” Zou says of Ryde and the rise of on-demand ride services throughout Southeast Asia. In early 2016, resentment toward ride- hailing services among taxi companies in Jakarta reached a breaking point. Echoing complaints that have dogged Uber elsewhere, the city’s cabbies had for months argued that their app-based rivals were burdened with few of the licensing and regulatory headaches that plagued them. In March, some 10,000 taxi and other public transit drivers assembled to block one of Jakarta’s busiest thoroughfares. Convoys of taxis and microbuses—a cross between a bus and a taxi—parked as many as seven rows deep on normally bustling boulevards. Aerial footage showed protesters stomping on the roofs and hoods of cabs whose drivers wouldn’t participate in the protest, and some hurled rocks and other projectiles at those in Go-Jek uniforms caught in the fray. Police wielding semiautomatic weapons were called in to help restore order. The mayhem in March did little to help the protesters’ cause. Jakartans, who are no strangers to violent protests, mocked the ruckus with the Twitter hashtag #angrybird in reference to violence meted out by drivers from the dominant taxi company, Blue Bird. The company apologized and atoned with free trips within Jakarta the next day. Grab, Go-Jek, and Uber say they are confident that regulatory headaches and protests will eventually be put to rest. The bigger question is, is there room in Jakarta for all three services? It’s almost impossible to determine which company is besting the competition. Go-Jek says it receives three times the number of orders for rides that Grab does. Grab says it has half of the ride-hailing market. Uber won’t say. But all three companies are in what appears to be an escalating arms race to discount fares. Last spring, Grab offered 20 free rides to users who signed up for a promotional code: an offer worth as much as $75 in a country where more than 40 percent of the 250 million–plus people earn about $3 a day. Go-Jek offered rides for 75 cents for the first 25 kilometers—about a tenth of what it would normally cost. And Uber offered free rides to first-time users of uberMOTOR, the ojek service it introduced in April. Its base rate of just under 8 cents is about a quarter of what used to be the market norm. Both Go-Jek and Grab defend these discounts and the related subsidies to drivers as a necessary marketing expense but recognize that it’s not a sustainable business model. Go-Jek has made a series of decisions that suggest that it may have another strategy. Last year it unveiled a service that hails rides to the nearest stop on Jakarta’s bare-bones bus system. The development suggests the company may mesh its services with a long-awaited light rail transit network due to open in Jakarta in 2018. And in May, Go-Jek announced it was mulling a partnership with Blue Bird to allow users to hail and pay for taxis through its app. Such an alliance would likely smooth over ruffled feathers at Blue Bird and with the regulators. About the same time, Makarim took to YouTube offering signing bonuses and expedited hiring to anyone currently driving for the competition. To clinch the deal, he appealed to his countrymen’s sense of national pride in supporting an Indonesian company. The video was not widely well received, but the overall approach could be a strong differentiator for the home-grown startup, which also debuted Go-Car, a four-wheeled competitor to Grab and Uber, last spring and closed a $550 million funding round in August. To date, the only clear winners in this on- demand battle are consumers like Tommy Prabowo. Prabowo is a radio presenter for a contemporary music station in Jakarta, and the 32-year-old’s voice is a regular companion on the commute to work. After his drive-time show, he’s often called on to emcee a bevy of promotional events around town. On a recent workday, Prabowo mulled how to get to three different gigs after his morning drive shift, including an album launch and a fitness event headlined by Jakarta’s popular governor. He also had to deliver a signed contract and an invoice to two separate clients. This could all mean hours in traffic. His solution was an all-of-the-above approach. Using his iPhone he couriered the paperwork via Go-Jek. He left his car and driver at the station and used a combination of Grab and Uber cars—whichever was closest—when he needed them. At the end of the day he caught up with his driver to take him home. Thinking of entering a new market? Use the Doing Business and Going Global databases on eBaker to better understand business regulations and environments in different countries or cities. Learn more about how Baker Library can help you with your information needs.